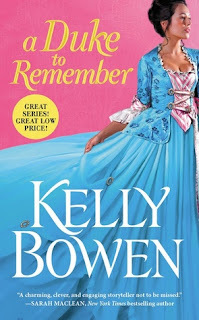 Nevertheless I truly loved A Duke to Remember, I genuinely enjoy Bowen's style and characters, she is certainly one of the best "new" HR authors. Specifically she has a stylistic aspect that I've encountered more than once in her heroes, that distinguishes her and that I believe to be one of her strongest point, and this is the capacity to create heroes who are yes manly, protective and powerful but sometimes they are also less strong and resolved than the heroines, sometimes they need the heroines' guide, support and advise to take the right decision. So realistic. I adore it, I'm gloating! Now, this is a lovely romance, I really cannot think about anything I didn't like, it's fast paced, great characters and the story is catching. Guess who's already madly in love with King?? Me. He reminds me of a mix between Dougan (The Highwayman) and Craven (Dreaming of you), if Bowen plays well her cards she has the chance to create a deeply memorable and unforgettable hero there. Please, PLEASE! I need more Dougans and Cravens in my life. Then there's also the fact that I'm also in love with the hero of this romance, Noah, who's one of the sweetest and caring in the world; I've so empathised with him, and I found the decision not create and angelic figure who forgives everybody who has wronged him in his life a true spot-on (honestly I wouldn't forgive too if I were in his position and if I had suffered everything he had suffered). Noah's interactions with the duke of Alderidge, Maximus, (Duke of my Heart) are also something very much worth reading. I was captured by the heroine, Elise, since the first novel in the series and she didn't let me down, she has strengths but also weaknesses. She's a way to communicate with the hero that is very "calming" and emotional. Their interactions made me all melting! I'm WAITING for Alex now.